It’s a really good idea to move slowly when you are training a llama.In this article, I will explain why. 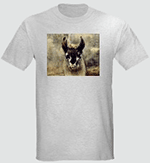 We will explore the situation of catching a llama who is in a field so that you can halter him. We’ll call this llama Thundercloud, because my husband and I used to have a llama named that and he was not an easy one to catch and halter. The reason that you will probably be moving too fast is that you are intent on your purpose. But the llama has noticed you and is also intent on his own purposes. Often, he would rather not be caught, though sometimes llamas like to be caught and haltered if they know that something enjoyable is probably in the works — like going for a walk with you. Llamas can run very fast, and this is perhaps the most important part of their natural protection. So if you head out quickly into the pasture, the llama may become wary. Thundercloud always did. On the other hand, if you meander as if you don’t have a care in the world, any llama nearby will certainly notice you — they don’t miss much — but you will not alarm them. Just wander into the barn and pick up a halter and lead rope. If you are going to use a little snack to entice the llama, get some cob (a sweetened corn, oats, and barley mix) or whatever you want to use. For some llamas, the snack will be enough that they will come right up to you. But not Thundercloud. Now you go into his pasture, without staring intently at him. If it is shaped so there is a narrow area that one person can catch him in, great. If he will go into his barn or shed, then you can get him there. But sometimes you’ll need to lure the llama toward a corner of the field. Wherever you are, you can continue to slowly walk toward the llama, slowly raising your arms out to the sides so you create a larger silhouette. If you see that Thundercloud is thinking of bolting, slow down or back off and look away. Then gradually walk closer. You could offer the grain with one hand and if the llama nibbles, your other arm could encircle the back of his neck and come around so that you have the halter in position to put on. Once you have the halter below his head, raise it up slowly and easily until you can slide it onto his face. 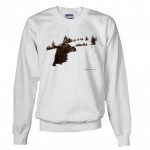 Then attach it and you’ve got a llama ready to go somewhere with you. Things may not happen so easily with some llamas. The first year we had llamas, Tumbleweed didn’t like us to catch him. Luckily our eight-year-old nephew came to stay for a few days. He caught Tumbleweed over and over, dozens of times, with far more patience than we adults had. After that, Tumbleweed was generally easy to catch. Learning how to train a llama involves more than just moving slowly. 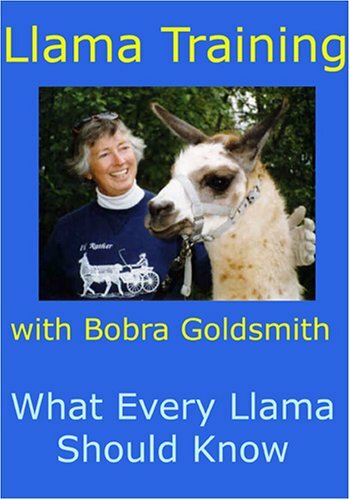 My husband and I were very lucky to have a mentor in Bobra Goldsmith, a well-known llama trainer. I always loved watching Bobra demonstrate how to work with a totally untrained llama or with one who had developed suspicion of people. 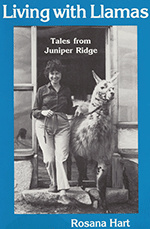 So many people easily learned llama training with her slow-motion haltering and other methods that she devised based on her close observation of these intelligent, graceful animals. My husband Kelly and I honed our skills a lot when we produced a video program with her, now a DVD only, called Llama Training with Bobra Goldsmith. The link takes you to more information about it here on this website, along with a $10 discount code if you decide to order it directly from us.